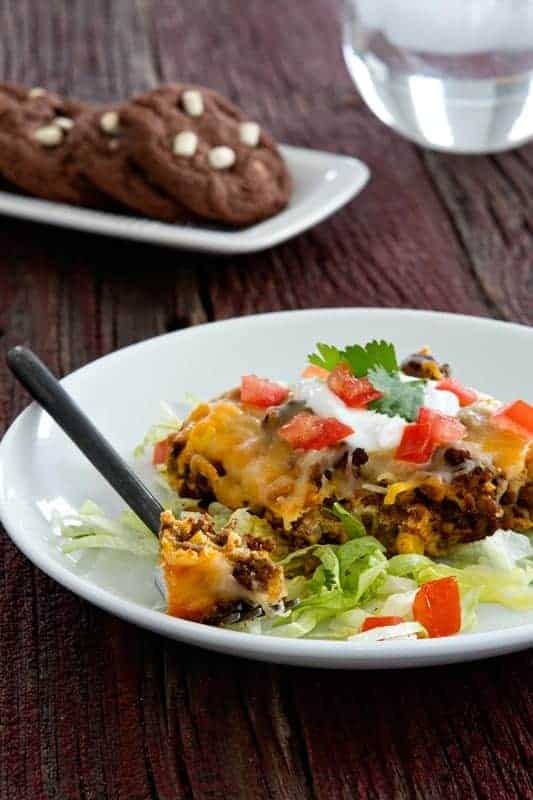 Impossibly Easy Taco Pie and Mexican Hot Chocolate Chunk Cookies will make these last few weeks of winter more bearable, I promise. Spicy and spectacular, perfect for enjoying after a long day of work. This is a sponsored post on behalf of Bisquick and Betty Crocker, two brands I have loved my entire life. All opinions are my own. Thank you for continuing to support the brands that make My Baking Addiction possible. I’ve done it, you guys. I’ve finally started cooking in my OWN kitchen again. Such a glorious feeling, one I hope I don’t take for granted for a little while. There’s so much space! and light! and work area! It’s pretty exciting around here, if you’re me. We’re enjoying dinner around our table, in our new home, for the first time. And it is simply wonderful. I’m wanting to remember these moments as long as I can. I’m thinking of dinners and desserts that’ll keep us around the table longer. Elle is starting to learn to eat with utensils instead of her hands, and watching those little eyes steady in concentration, the peak of a little tongue while she works at stabbing a bit of meat – well, I could watch it all night. 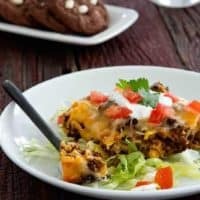 To make sure we’re all well fed while we do that, I’m dreaming up wintery warm combos, like this Impossibly Easy Taco Pie and delicious Mexican Hot Chocolate Chunk Cookies. You’d be surprised what an adventurous little eater our Elle is. She LOVES food with flavor, and I am here to provide it. Feel-good foods that we all love. What I’m going for here is an overall feeling of well-being. You know the one. When it’s still chilly outside, and there’s a fire roaring in the new fireplace, a gooey, cheesy casserole bubbling away in the oven, and the scent of chocolate chip cookies wafting through your house – that’s the feeling I’m talking about. Now that we’re getting back into the routine of dinner in our own kitchen, it’s especially important that we’re getting something delicious on the table early enough to still get bathtime and bedtime routines taken care of. We’ve still got lots of unpacking and our regular work routines to get back to too. You might think two people working from home would be a little more leisurely, but it’s not the case. Eric and I both burn the midnight oil after Elle goes to bed, so getting that dinner made quickly is just as important to us as parents who work outside the house. So when I tell you that this casserole is easy enough to pull off on a random Tuesday night, I’m not tellin’ tales. It really is. And so are these decadent cookies! Mexican Hot Chocolate is known for its extra spice and heat – usually provided by a little cinnamon and cayenne added to the drink. I took Betty Crocker Double Chocolate Chip Cookie Mix, added some hot chocolate mix, and kicked everything up a notch with the addition of cinnamon and the tiniest pinch of cayenne. Just enough to make your tongue tingle. Even Elle loved ’em, so if you’re heat-phobic, don’t worry. Decadent home baked cookies are just one way to make your family dinner last a little longer. Brownies, a cupcake – anything you can whip up to extend family time just a little bit, keeping those teenagers away from their phones and the little kids talking about their day, that’s what we’re after here, and I think this is a dinner and dessert combo designed to make it happen. Oh, and if your kids are anything like my former students, I know asking, “What did you learn at school today?” goes nowhere fast. 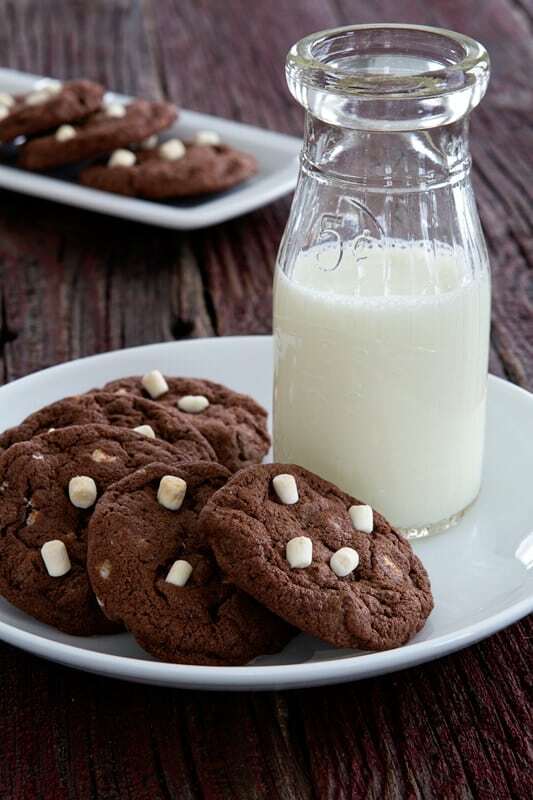 Try this one instead; “What was your favorite part of today?” – I promise, the details will start flowing – between bites of Taco Pie and Mexican Hot Chocolate Chunk Cookies. For other fantastic dinner and dessert ideas, you can visit the Betty Crocker website, and follow #getyourbettyon on Facebook and Twitter. 1. Preheat oven to 400°F. Spray a 9-inch pie plate with nonstick cooking spray. 2. In a 10-inch skillet over medium heat, cook ground beef and onion until ground beef is brown and cooked through. Remove from heat and drain. Add in taco seasoning and stir to combine. Stir in green chilies and spoon seasoned beef into prepared pie plate. 3. In a medium bowl, combine milk, eggs and Bisquick mix, whisking until well combined. Pour into pie plate directly over beef. 4. Bake in preheated oven for 25 minutes or until knife inserted in center comes out clean. Sprinkle with cheese. Bake 8 to 10 minutes longer. Cool 5 minutes. If desired, serve with shredded lettuce, sour cream, tomatoes and salsa. I think I just found one of my dinners (and desserts!) for next week. 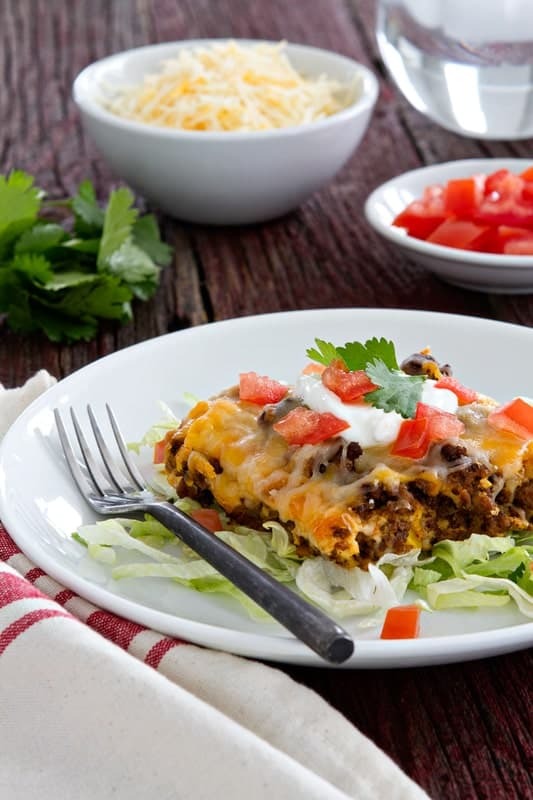 That taco pie looks SO good! Live in the land without biscuits. .. any suggestions as a substitute? Mexican hot chocolate cookies? *Mind blown*! These recipes are so great. I often run into the “what the heck am I going to make tonight” Tuesday night conundrum, so I’m thrilled to add this to my weekday recipe list! I hope you get the chance to try them. Thanks so much for stopping by. When I was a kid, Hamburger Helper made a “taco helper” that I loooooooved. They stopped making it after just a couple of years, though. I’ve thought about that stuff a lot (probably too much!) and this actually reminds me of what it looked like! I’m going to have to try this! I hope you get the chance to try it and maybe it will be close to what you remember! Thanks so much for visiting. Made this for my hubby and me! It’s terrific!! It seems like I make the same things every week and this was a great change! Thank you! So happy to hear you enjoyed it, Penney! Thanks so much for stopping by and leaving your feedback!